Helpful Toddler Toys Suggestions To Help Every Parent And Child. What is your personal attitude toward toddler toys? Are you one of those parents who enjoys wandering through the toy store aisles, buying everything that is bright and shiny and that you know your child will love, or are you a toy minimalist who will carefully select a very few ‘perfect toys’ and then warn relatives not to buy your child Christmas or birthday presents because you don’t want his toy room cluttered with ‘junk’ or garbage? Maybe you take a middle road, and can let your child enjoy whatever the grandparents bring while still taking a ‘research carefully’ road for your own shopping. What is the best way to go shopping for toddler toys? There’s no one answer; it depends on your values; your own beliefs regarding enjoyment, quality, and education. There are some principles for toddler toy shopping that can benefit all of us, though, and those are what we’ll look at on this page. How do you research a given toy? What do you look for in toys? These are topics we’ll cover here. Step 1: Amazon.com. It doesn’t matter if you prefer to shop online or visit the local toystore. There’s one secret that savvy toys for toddlers buyers all share: they check the reviews before they spend their hard-earned cash. Amazon is a treasure house of information from other parents who have bought these same points, have watched their toddler play (or not play ) with it, and then have written reviews detailing good points, bad points, and whether they are sorry or glad they made the purchase. Step 2. Touch and Feel: Of course, if you are shopping online and don’t want to leave your house this doesn’t work, but even if you want to take advantage of online deals and convenience a ‘touch and feel’ visit to a toystore may not be amiss. Spend some time touching and feeling the toys you are interested in. If it feels cheap and flimsy, it probably is. Brittle plastic is also very prone to breakage. Step 3. The Toddler’s Eyes: You’re not shopping for yourself, but for him, and bringing your toddler into the toy selection process means you know you’re buying something that really appeals to your little person. Show him a toy you’re interested in and see if his eyes light up. If you have the opportunity to let him play while you’re watching, let him. One precaution, here: you do want him to know that toy stores are for looking, not buying; so don’t make a habit of responding to requests to buy on the spot. If you consider playing with toys an important part of your toddlers education—and you should--- how can that translate into your toy shopping? Buy open ended toddler toys that give your child room to grow and expand in; toys that your child can use in whatever way strikes his fancy today—and then in another way tomorrow. 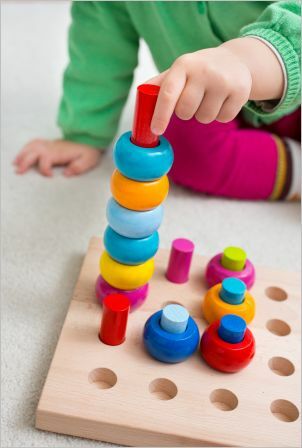 Open ended toys for toddlers are toys that encourage imagination, exploration, and creative thought. Often they are the simplest of toys; things like blocks, balls, trucks and figures. So when you go buy toys for your toddler, stop and think a moment. Is this the kind of toy that can be used just in the type of canned play scenario as pictured on the box, or is it a toy your child can invent over and over and over again?